I called my husband, Ramjan, from the office to find out if he was going to be at work that evening because I was planning to have our next date night and it would have been quite nice if he could be there! He was more than happy to join, so this month’s restaurant review was at the Horton Inn on Cranborne Road. 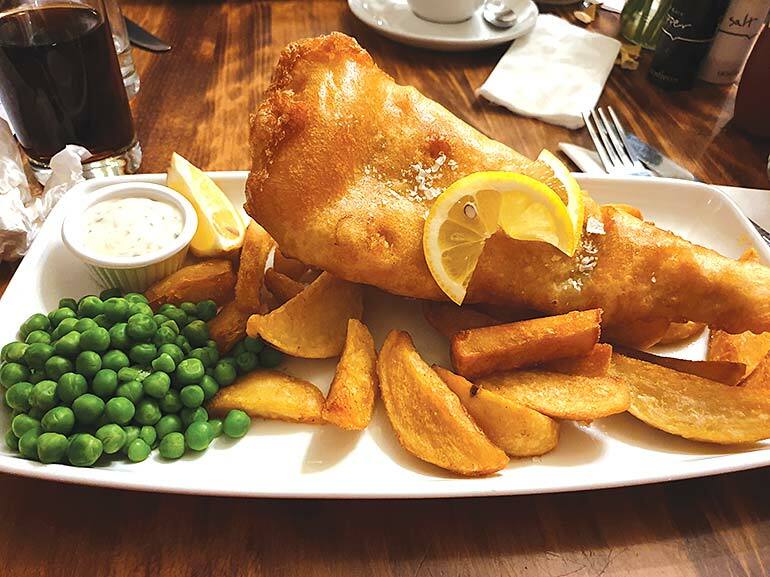 The Horton Inn is a traditional 18th century hostelry that stands proudly in the stunning Dorset countryside, with a bar, restaurant and eight letting rooms. After a long drive through undulating and wiggly, semi-rural roads with no street lamps we, arrived at our destination. The large car park was already comfortably filled, and as we walked inside, we were greeted by a table laden with lots of gifts, flowers and alcohol. We got there just a few minutes before ‘The world’s biggest pub quiz’ was about to start and the pressies were not for me but were in-fact raffle prizes for helping to raise money for Prostate Cancer UK. What a nice thing to do. Our table was reserved, and a good job too, because it was heaving in there but that didn’t stop us from getting fantastic customer service. They even lit the fire for us, which made it so cosy. We ordered the tempura prawns with sweet chilli dip and oven baked tiger prawns in a garlic butter sauce for starters. 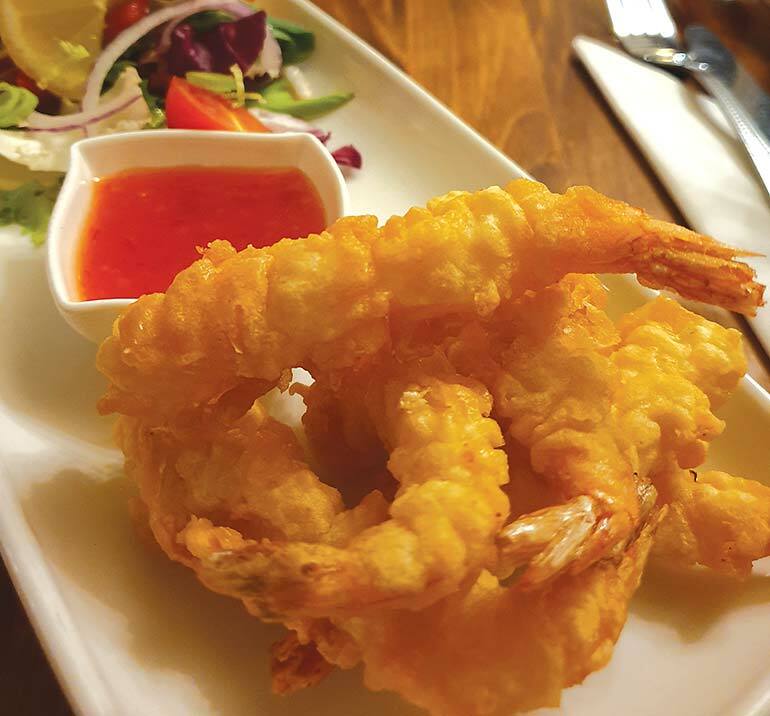 I was pleased to see the tempura prawns were made in house, lovely and crisp with a light batter. The juicy oven-baked prawns were served in a bowl accompanied with bread and salad. The perfectly sized portion for starters meant I didn’t feel full before my main arrived. 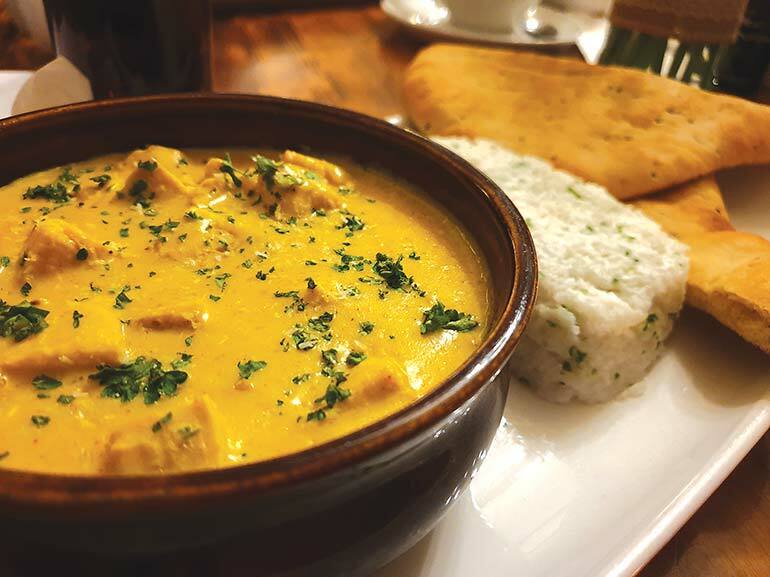 I ordered the classic, traditional fish and chips with peas and salad while Ramjan ordered, you wont believe this… turkey curry with coconut rice and naan bread. ‘Why on earth would he order that?’ I thought. With both of us coming from the Indian catering background, I thought we could have been at an unfair advantage. The menu selection was varied from the likes of steak pie to jacket potatoes and quite reasonably priced. The specials change on a daily basis and it is clear the chefs take pride in their work. My main arrived and it was delicious. I had requested crunchy chips and that’s exactly what I got. The turkey curry arrived and looked similar to a chicken korma. It tasted slightly sweet and creamy too and I could taste the curry flavour. The coconut rice was al dente, as the grain was present. It had a hint of coconut in the rice, which I thought was very pleasant. The naan bread was surprisingly impressive because it wasn’t made in a tandoori oven yet was still light and fluffy. I could see Ramjan had his eyes on my fish and chips so we ended up swapping. He thoroughly enjoyed what was left of my fish and chips and I finished off the turkey curry. The blackboard with the desserts was brought to us and I chose the chocolate fudge cake with custard and Ramjan had the sticky toffee pudding with ice cream. Considering he thought he was full, he whooshed it down, way before I could even reach the halfway mark with mine. A grand portion of heavy chocolate fudge had beaten me! As our evening was drawing to an end, the fire was roaring and the room was toasty. Between us we decided the Horton inn is a real family establishment, catering for the needs of children as well as adults. The staff managed us on a very busy night, and the till system had crashed too. The service was outstanding and The Horton Inn lives up to it’s reputation of being a family friendly, traditional pub and hotel. If you are ever in the area, pop in for a drink and a tasty meal, traditional or otherwise.